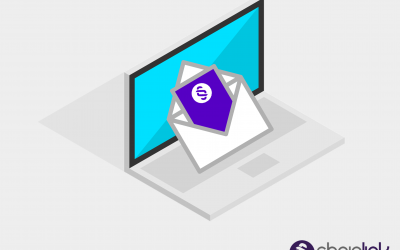 Since you have to send transactional emails anyway, why not make it an enjoyable and productive experience for you and the customer? 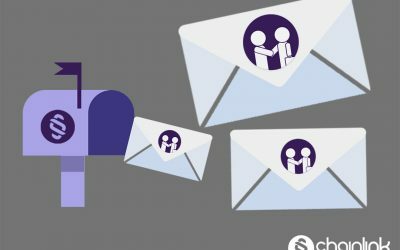 Too many marketers underestimate the power of transactional emails, but they can be an extremely valuable tool. It’s disappointing that so many marketers disregard the massive opportunity that sending email receipts presents them. 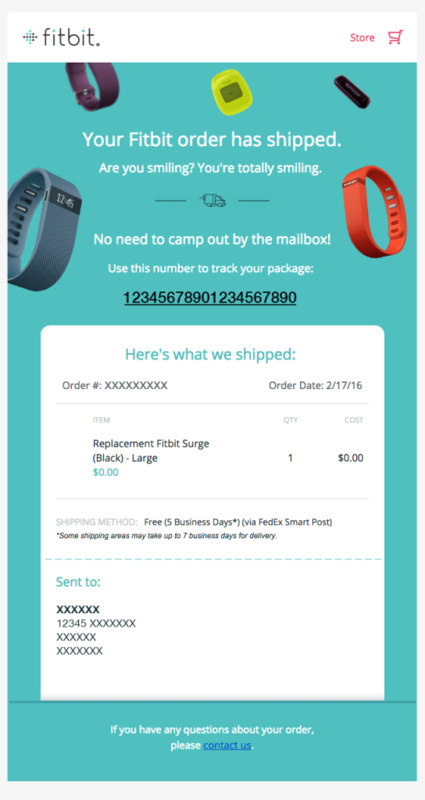 Even if you’re not an ecommerce business, an emailed receipt is almost always preferred by customers. 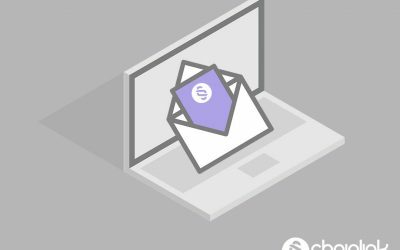 A non-pushy CTA is the perfect way to make the most of an email that you have to send anyway. The combination of the fun GIF and the easy-to-read text with a clear tracking number makes this email enjoyable to open. The layout of this email is impeccable. 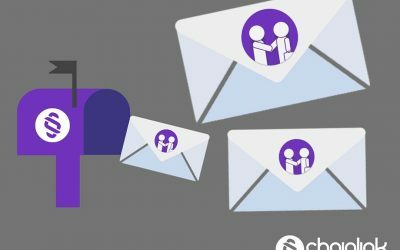 The graphics and pun are on point, and they manage to squeeze in all the important order and exchange information without overcrowding the email. The seamless incorporation of the social media icons also adds a great touch. 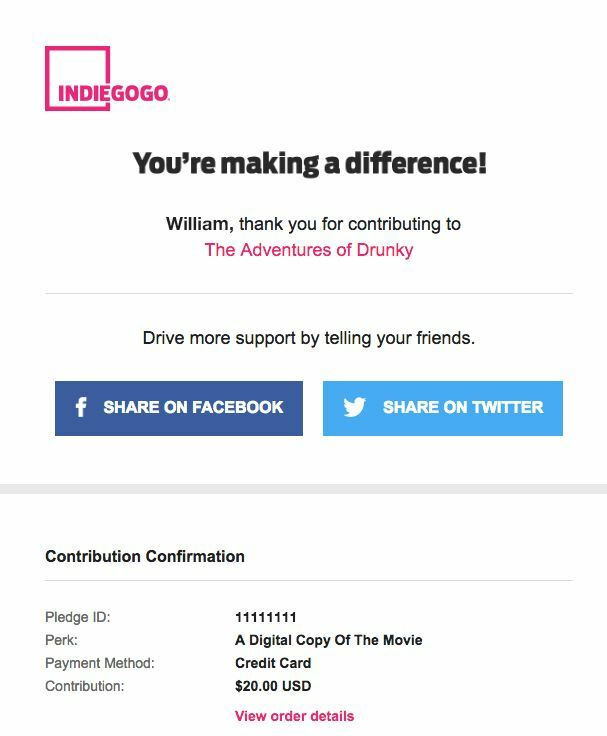 Everyone likes to know that their dollars are going towards something that counts and thankfully IndieGogo has the advantage that their business revolves around this idea. The email doesn’t need much else, and IndieGogo knew that. This email underscores the importance of knowing your audience and organically offering the chance to contribute to more campaigns that could interest them. The curated preview of other campaigns to explore is a smart move. Receiving a receipt email with too many elements or a distracting design defeats the purpose of a straightforward and informative message. 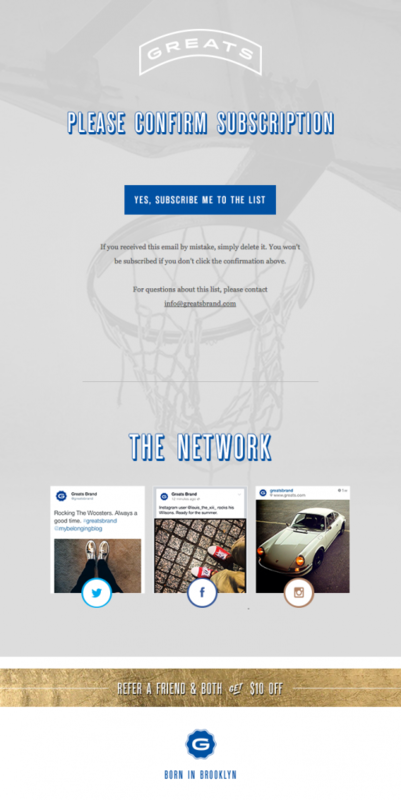 Huckberry struck a great balance between clean, minimalist email design and including plenty of CTAs. The email not only provides the most important order information first (with a couple of CTAs sprinkled in), but also transitions nicely into displaying trending products toward the bottom. When it comes to food pick up and delivery, no mistakes are tolerated. Chipotle designed these emails to prioritize when and where to pick up (we love that a Google Maps snapshot is embedded right in the email). The clear communication and simplicity of this receipt is spot on, leaving no room for confusion. 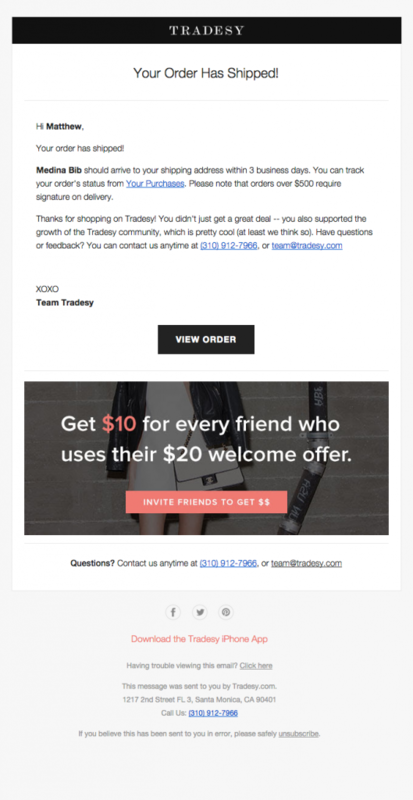 The trick with these transactional emails is that the better they are designed, the less people will notice them. You’ll leave a subconscious positive impression on customers if your password reset process is super easy and quick. On the other hand, if extra steps are involved, or people can’t get the information they need. 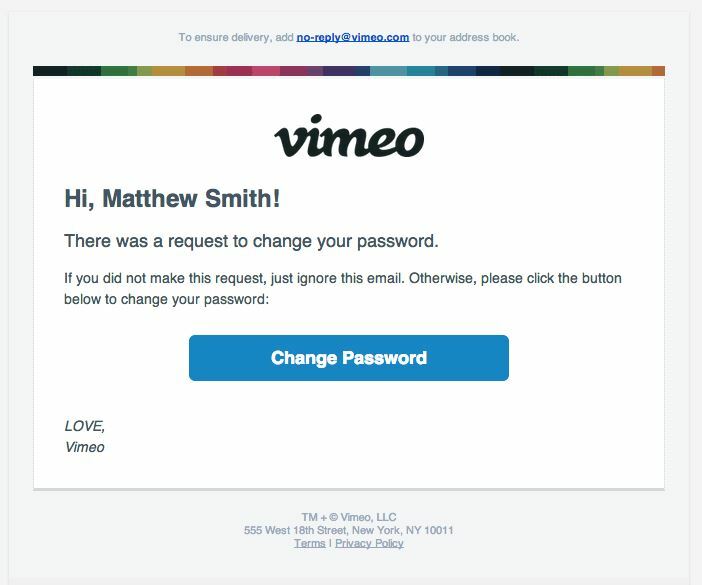 Every time that you’ve received password reset emails, you were probably always in such a rush to get the information that you barely noticed the design. 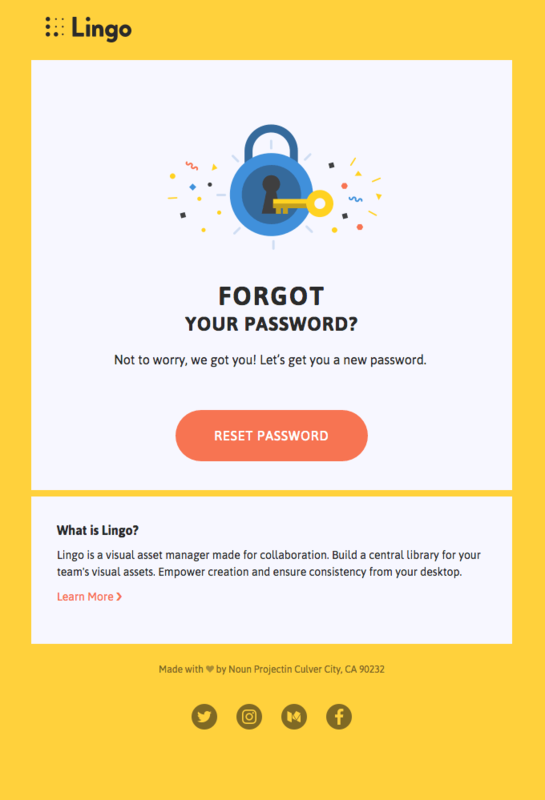 What makes this email great is that the design is noticeably bright and fun, without making it any trickier to expedite the password reset process. If someone changed your password (that wasn’t you), you would want to know as soon as possible, in the most straightforward possible way. 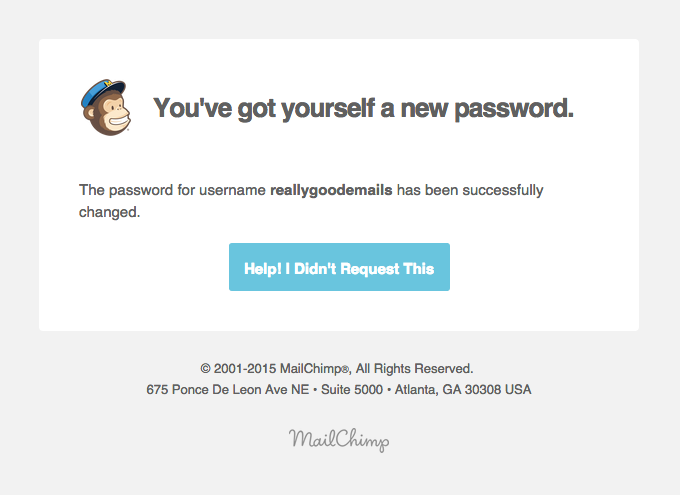 MailChimp understands this and cuts straight to the chase. This is an ingenious confirmation email that recognizes the fact that its primarily mobile users will want an easy-to-tap way to confirm and move on with their lives. 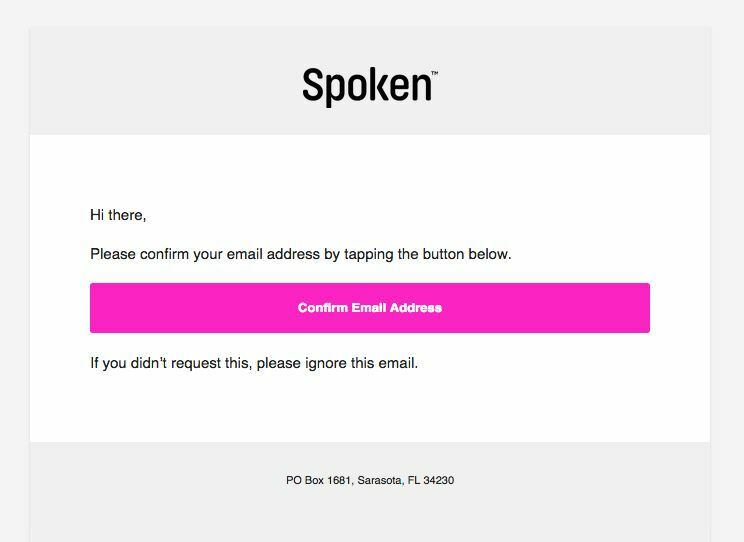 Spoken demonstrates they know their audience, and helps to make their lives easier. All internet users prioritize the security of their inboxes and accounts more than ever before. 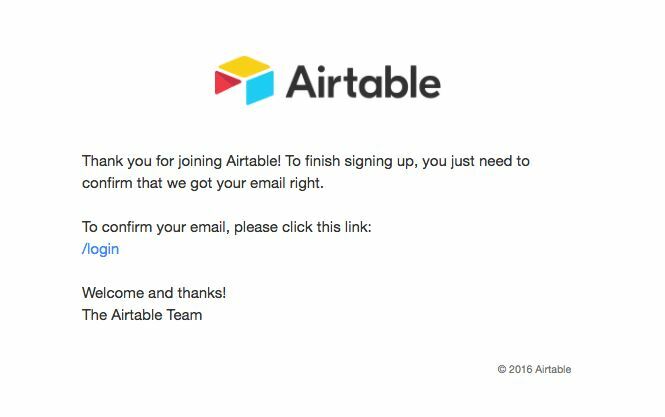 These emails need to be well-formatted and convince your subscribers that they made the right choice to sign up. 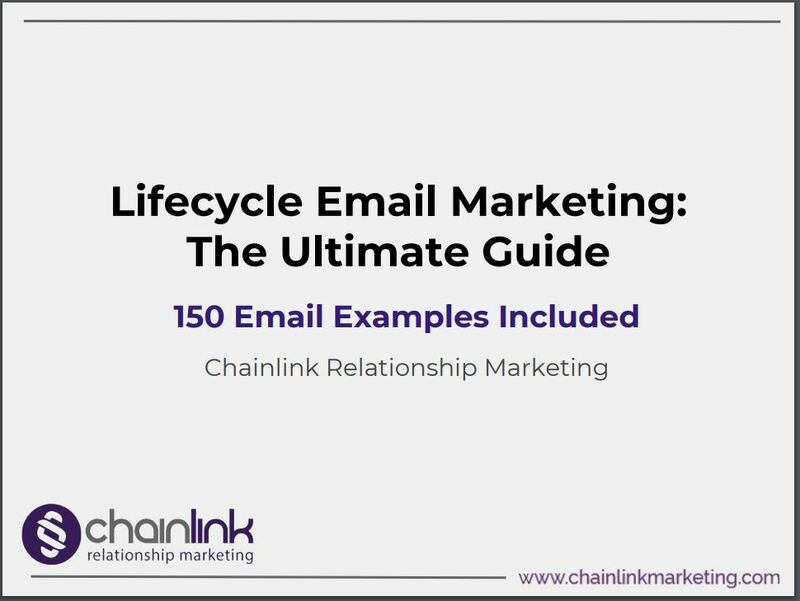 These emails can have an eye-catching design, but the main focus should be to make them as easy to act upon as humanly possible. 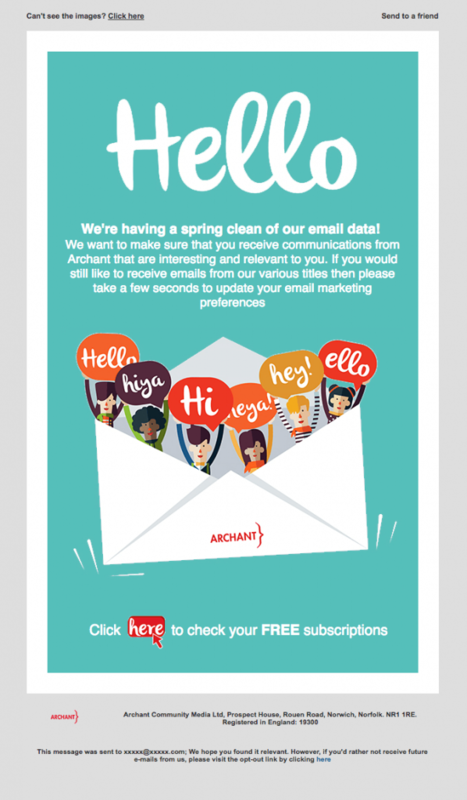 Archant presents this email opt-in as an easy choice. Anyone who enjoys receiving the email will act after receiving this message. 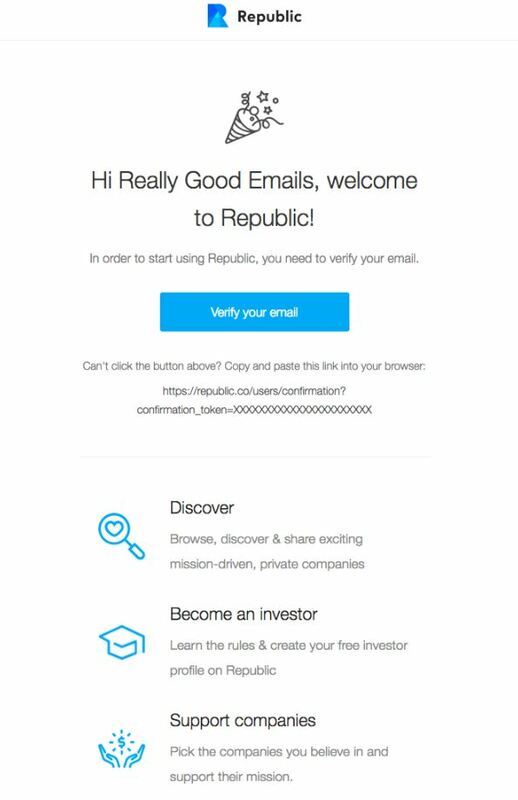 This opt-in email is impressive because of the thought that went into the design and unique lettering (even though it’s just confirming your email sign up). 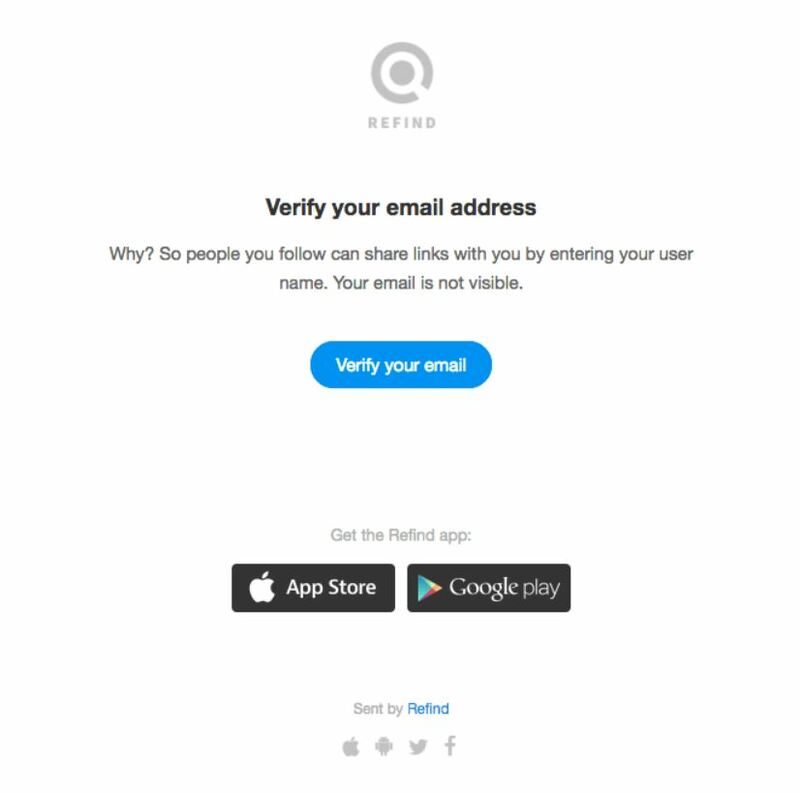 This email doesn’t let you think twice about verifying your email, providing the link to copy and paste as well. Many companies are smart enough to do this today because there is always the possibility of a button breaking and a client getting frustrated. 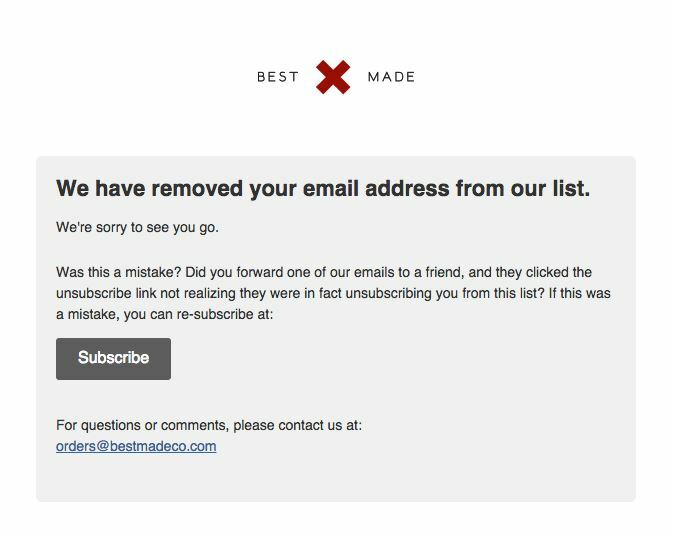 Checking in with subscribers in a way that seems to propose unsubscribing seems like a risky move. The reality is that honesty trumps everything else. If you’re transparent with your audience/customers and give them the choice to take a break, they’re more likely to have a positive view of your brand (and even possibly re-subscribe in the future). Refind is self aware enough to realize that they don’t need anything extra in their opt-in email. This traditional, easy-to-read message is effective without wasting anyone’s time. 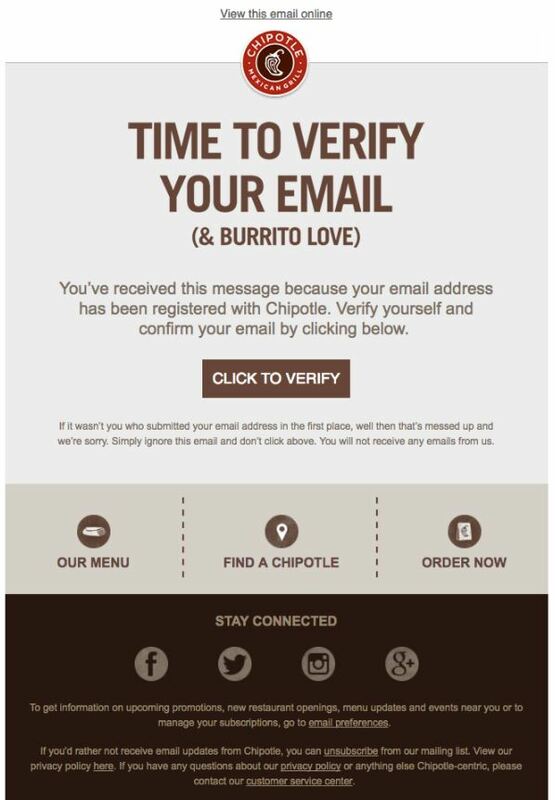 Chipotle knows its loyal customers will be happy to receive email updates and verify their “burrito love.” The friendly tone of their email is perfectly on-brand with its target audience. These emails should be functional and beautiful. Don’t overdo it: remember that with transactional emails, utility is more important than what it looks like. The Black Tux’s tips for grooms-to-be have been extremely popular, so the company seized the opportunity to release exclusive content before another big guide was released. Although this RSVP email is not for an event, we like the way it feels like an event. It builds up the anticipation before a new product/program launches. The way this event is introduced as hyper exclusive works ranks in the event’s favor. 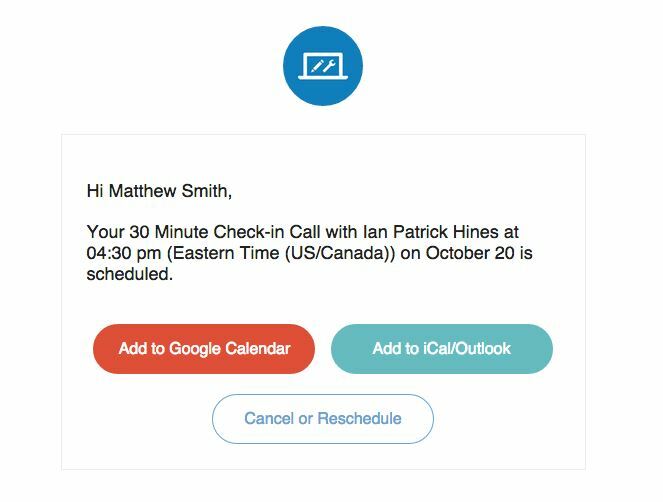 Most importantly, the way that the Facebook event RSVP call to action is there twice makes it impossible to miss. The simple design and lighthearted tone make this email the perfect holiday RSVP request. Including Google Maps at the bottom of the email is super smart as well. One of the best ways to ensure your notification emails live up to their potential is to ask yourself how you would feel if this notification popped up on your phone while you were busy doing something else. Are you annoyed? Grateful for a quick, easy-to-read, and memorable reminder? Imagine what it would be like to receive your own email, and adjust accordingly. This succinct email is the epitome of short and sweet. Calendly’s options to add it to either your Google calendar, iCalendar, or Outlook Calendar is great. Any way that you can make subscribers’ lives easier, the better. Everyone likes to receive notifications of good news. The way you can make this kind of notification even better is by making it personal. 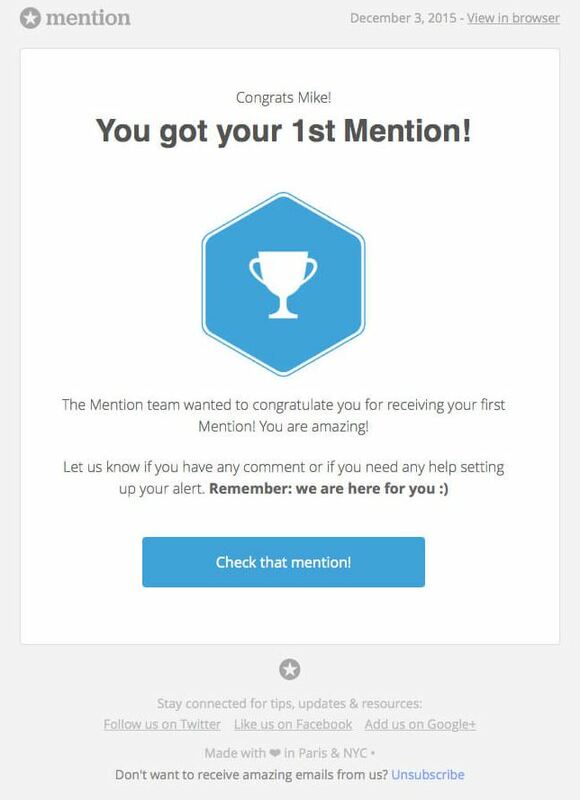 We love how this email comes across as if mention.com is your own personal cheerleader. The trophy is a great touch. Celebrating your clients/customers/subscribers whenever they reach a milestone is always a good idea. When businesses in the service industry approach communications with customers/clients as a conversation between two colleagues on the same team, information and ideas flow a lot more naturally. 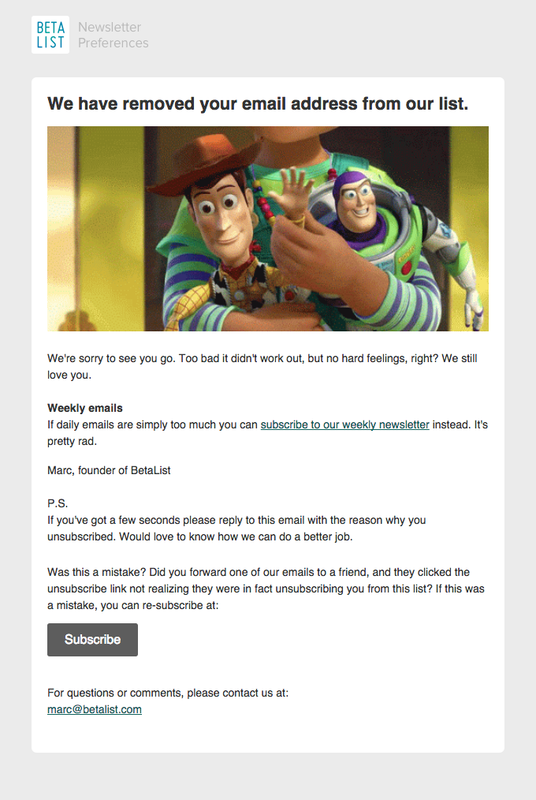 Even though Revue is just email newsletter software, they make their reminder seem personal and not automated. It’s great that it reminds the subscriber of their last report’s results as well. 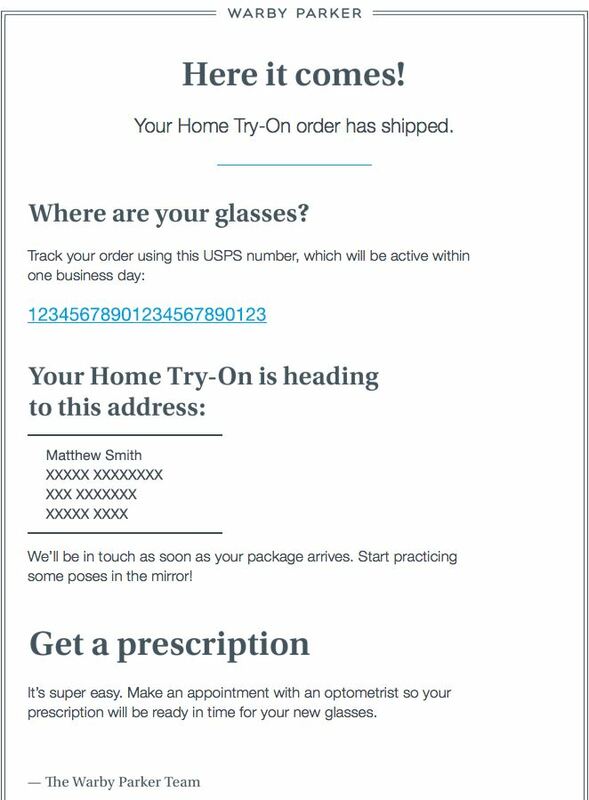 Like the other transactional emails we’ve seen so far, some of the best shipping confirmation emails are the ones that say what they need to say and nothing else. At the same time, simple and unique design can’t hurt. Tradesy provides customers with all the crucial information regarding their purchases, while also thanking them for their support in helping them grow. They know how to tie a confirmation email with a thank you email and reap the benefits of both at the same time. This email could almost be too plain, but the commitment to personalization and customer service shines through. In Warby Parker’s case, personalization is one of the defining marks of the brand. We love how the teasing tone of this email and its bright colors make it inviting and fun to open. Compared to most confirmation emails (that are either boring or dizzying) this email has great design. 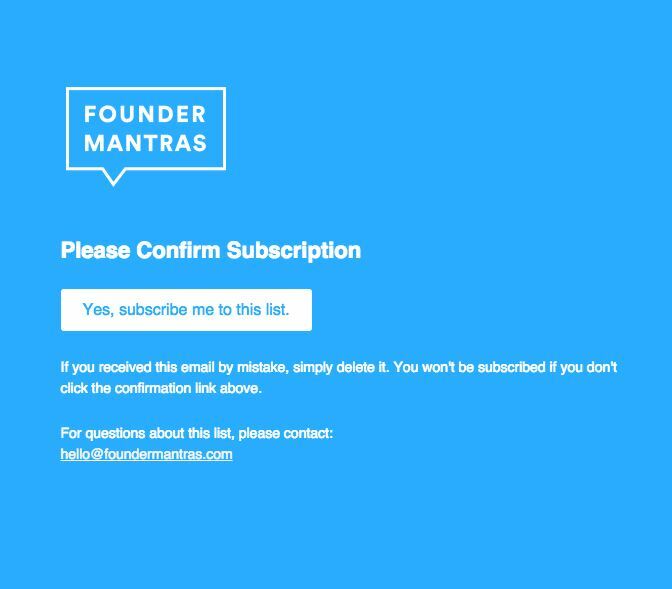 The first few emails after someone subscribes to your newsletter are extremely important. Be concise and don’t risk leaving a negative impression. 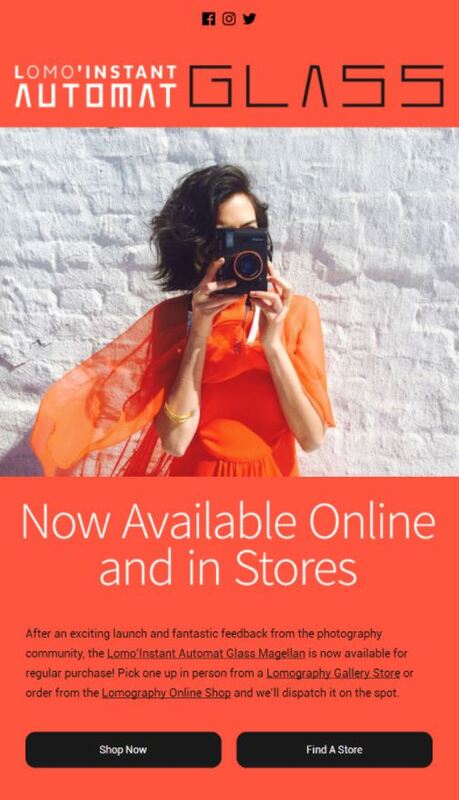 The pop of color is working to the advantage of Founder Mantras. Color can be overused and abused but in this case, the white call to action seems to be begging to be clicked on. Green Chef focuses on clearly communicating the necessary information and setting expectations so that customers can rest assured they’ll receive the service they’re paying for. 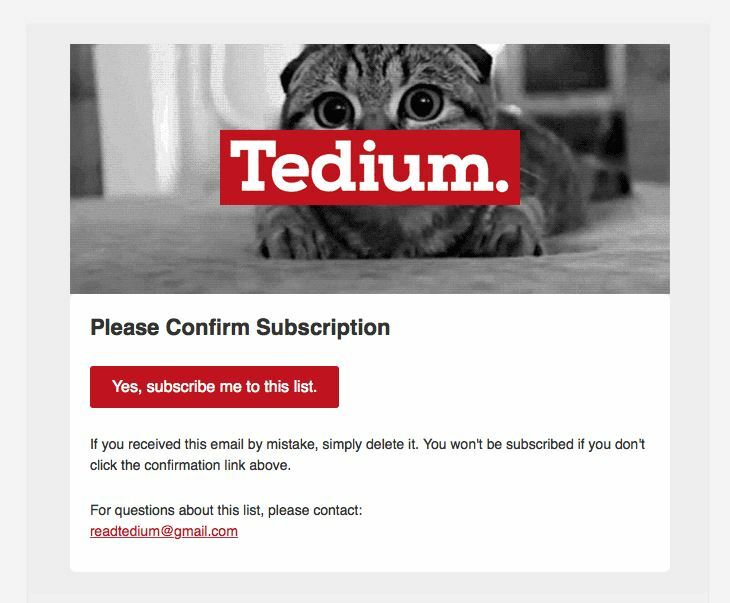 The cute photo and minimal copy directs recipients to do what matters most first: subscribe to Tedium’s emails. 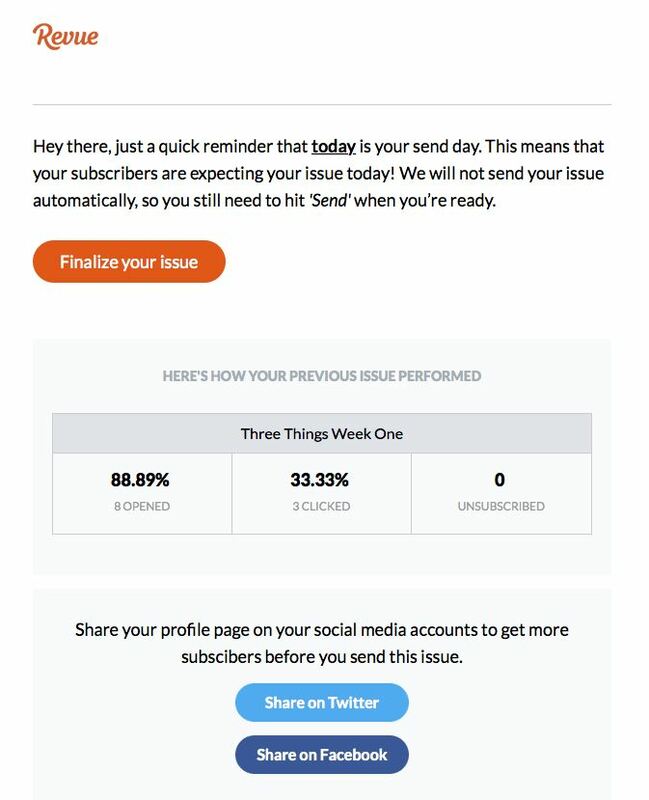 The time sensitive nature of subscribing before your trial ends will inevitably catch someone’s attention when they open this email. This email is well executed overall, but generally it’s better not to rely on scaring people into subscribing because they’re afraid they’ll miss a deal. 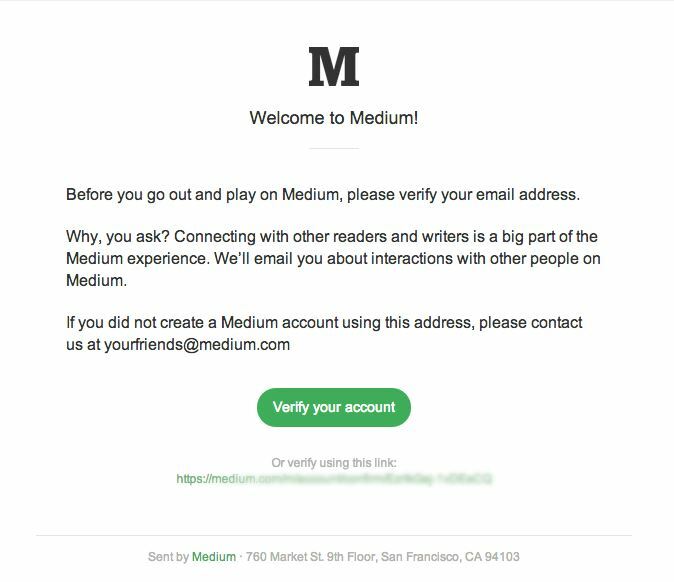 The fact that medium.com introduces itself as a fun experience among a community of friends is an excellent approach. After all, users are proven to be more likely to respond to and engage with friends and peers than a brand. We included this example to show what to do if you want the absolute least amount of text/graphics. The beauty of this email is that it’s effective but it’s also so easy to build in a template. Even the least tech savvy members of your team could replicate an email like this. It’s not a great feeling when you know people are sick of your emails, but the way you handle the rejection is half of the battle. Also, the way you respond to someone cancelling a subscription will make them more or less likely to re-subscribe. There are three great things about this email. First of all, the comical usage of the Toy Story image is sure to make people smile. Second, the dramatic line of “we still love you” and the request for feedback. Finally, it was also wise to make the email say it was from the founder of the company. Even though it’s a simple tweak, it makes it easier to react to a message that says it comes from a single human (versus an entire team or whole company). This email is sincere and thoughtful, but doesn’t spend a lot of time trying to win you back. 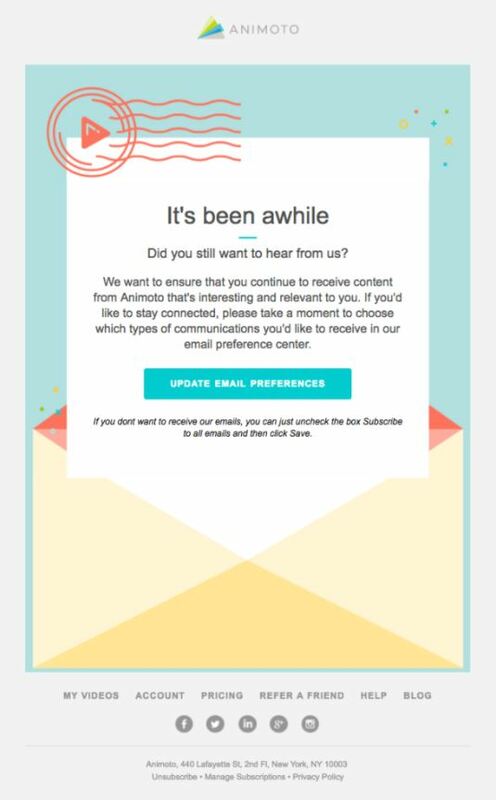 It’s nice that they aren’t pushing to get you to re-subscribe, but instead they’re proposing it in a nice way. The subscribe button is clear and easy to find, but it’s not in your face. 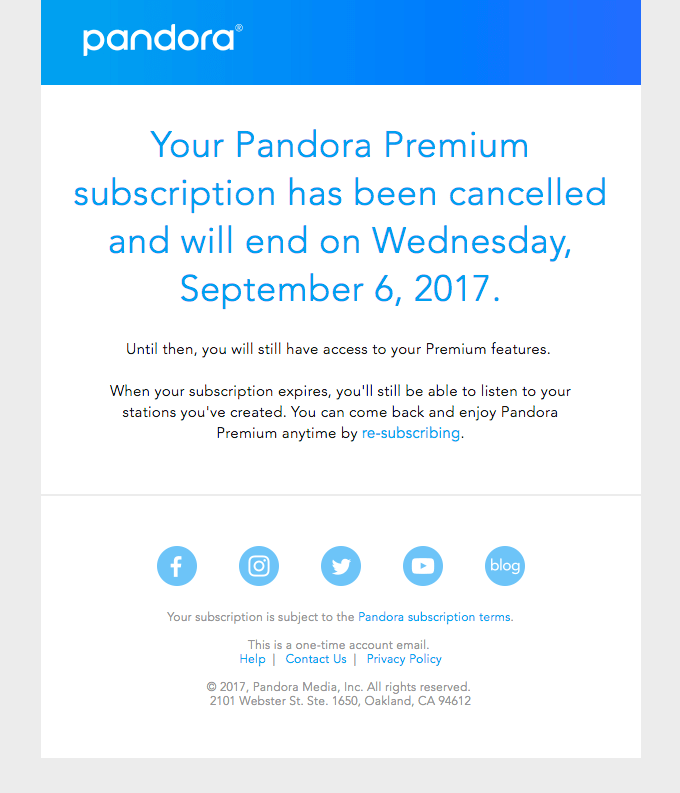 In an increasingly competitive world of music streaming, it’s good that Pandora maintains a warm tone that lays the foundation for re-subscribing. This email is consistent with their new modern, sleek re-branding. 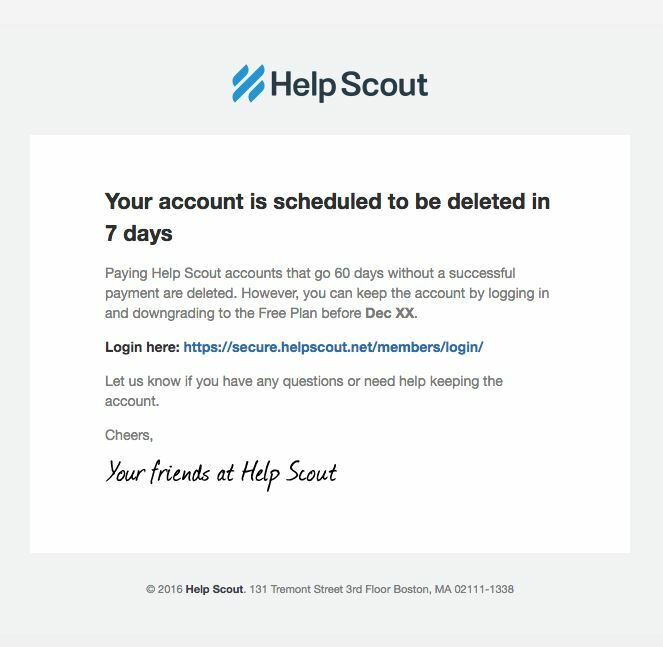 We like the way HelpScout communicates the important message that an account is scheduled to be deleted, and presents subscribers with alternatives. When users are anxiously awaiting an email, you want it to be painless for them to finally open the email. This message serves one purpose, and it serves it well. 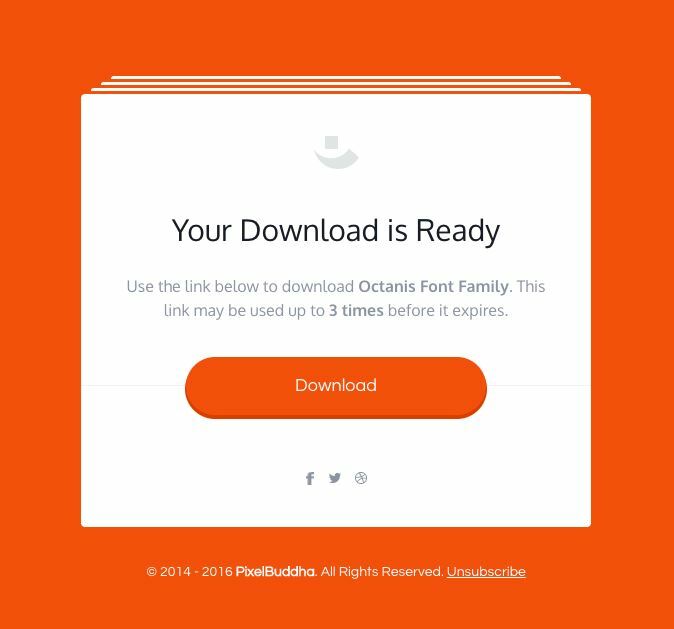 PixelBuddha is sure to specify the number of downloads allowed as well. 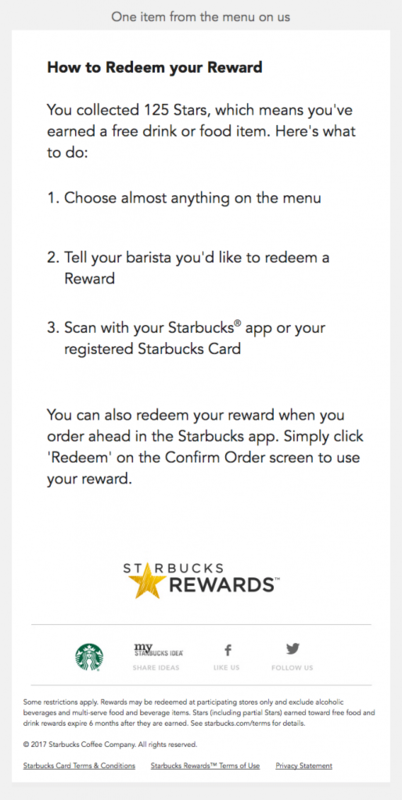 Loyal Starbucks customers patiently await every reward they earn, so making these emails as accessible and easy to follow as possible is extremely important. The announcement of a long waiting product launch deserves an email that stands out. It’s always an added bonus when you can propose or add something else at the same time.